Dynamic Positioning (DP) workshop for navigators on ESVAGT’s Service Operation Vessels (SOV) strengthens risk assessments and trains optimal reactions. The new organisation in ESVAGT will strengthen both its focus on HSE and its continual optimisation of internal processes within service delivery. After a 2016 entirely without LTI, ESVAGT has recorded a few lost time incidents in 2017. “We must strengthen our safety culture and prioritise our focus on good behaviours,” says head of HSEQ, Charlotte Feldvoss. Every ESVAGT employee has to renew their OPITO certificate every third year. This maintains competence levels and ensures good knowledge sharing. They have courses and certificates. They practice theory via remote learning and they train it in practice ad nauseam. ​ESVAGT was assessed by FPAL on 10 and 11 March 2016. ’Ambitions by Vessel’ kick-off: Every ESVAGT vessel is a flagship! 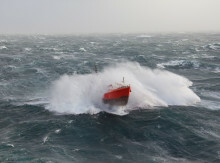 ESVAGT has been classified ’high performing’ after unannounced vessel inspections. VESSEL UPGRADES: Part of the original ESVAGT fleet is undergoing modernisation. ESVAGT’s workshop is being optimised to improve operations, logistics, the environment and working environment – and to prime it for continued growth. ESVAGT has also reduced fuel consumption by changing to another type of paint on vessel hulls. With an extra, small diesel generator, C type vessels can save up to 25% on fuel consumption. Esvagt Cornelia named in Trondheim. 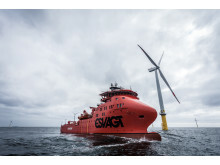 The upgrade of the ‘Esvagt Bravo’ improves mood and job satisfaction. The upgrade of the ’Esvagt Preventer’ has improved working and living conditions on board, say crew members. Environmental optimisation of SOVs achieves the desired effect. ESVAGT’s continual measurement of ’days without incident’ sets a new record every day. New Risk Management Tool to unify understanding of risk at ESVAGT. Nicklass Døssing started as a motorcycle mechanic and via management training in the Ministry of Justice, he is now Lead Auditor and HSEQ Coach for ESVAGT. On 27 October 2014, ESVAGT achieved a milestone in the shipping company’s history, with 600 days without lost time incidents.